Recipients of the 2009 MacArthur Fellowship - sometimes referred to as the MacArthur "genius grant" - are an interesting mix of writers, artists, journalists, scientists, attorneys, entrepeneurs and physicians who have one thing in common: they have demonstrated "exceptional creativity in their work and the prospect for still more in the future". The 24 fellows will receive a $500,000 stipend over the course of five years, no strings attached. Lin He's research involves a class of small ribonucleic acid, or RNA, that are not transcribed into protein like messenger RNA. Instead, these microRNAs or miRNAs bind to messenger RNA to regulate the amount of protein produced. This entirely new level of dosage regulation in mammals was not realized until 2000, even though miRNAs were first discovered in 1993. Now, miRNAs have been shown to be involved in many aspects of development and diseases, He said. "MicroRNAs are a mechanism to fine-tune gene expression simultaneously in many different pathways, achieving a homeostasis very much needed for many biological processes," He said. "In the case of cancer, where some microRNAs behave abnormally, detrimental effects will occur due to the loss of proper gene regulation by microRNAs." He has shown that miRNAs play a role in a broad range of cancers, in particular those such as lung cancer that involve mutations in the p53 tumor suppressor gene. She is also investigating the role of miRNA in the development of B cell lymphomas. 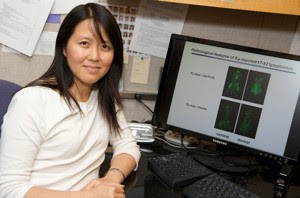 "In an area that has generated intense effort among many leading researchers, Lin He has established early in her career the capacity to make significant advances with direct implications for the development of future cancer treatment strategies," the MacArthur Foundation noted. Beth Shapiro is an Assistant Professor in the Department of Biology at Pennsylvania State University. 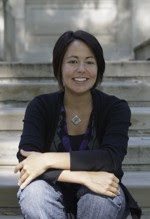 She is "an evolutionary biologist who integrates molecular phylogenetics with advanced computational biostatistics to reconstruct the influences on population dynamics in a wide variety of organisms." She is using the methods she and her colleagues developed to study the population history of recently extinct (like the dodo) or currently threatened species to assess the effects of environmental change on polar bear populations, an approach that will help in shaping conservation efforts. She also has been studying the evolution of RNA viruses in individual patients, an approach that may help in understanding the development of virulence in human pathogens. Prior to joining Penn State in 2007, Shapiro was director of the Ancient Biomolcules Centre at Oxford University. She was also named one one "America's Young Innovators in the Arts and Sciences" by Smithsonian Magazine. America's Young Innovators in the Arts and Sciences: "How to Make a Dodo"